For the temporary relief of minor discomfort in sore mouth. From everyday irritations to minor sore throats, few things are more frustrating than throat discomfort. 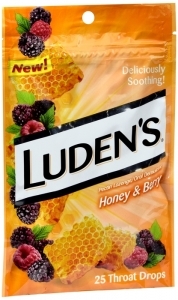 Luden's offers great tasting throat drops that will soothe your irritated throat anywhere, anytime. Adults and Children 3 Years of Age and Older: Allow one drop to dissolve slowly in mouth. May be repeated as needed or as directed by a doctor. Children Under 3 Years of Age: Ask a doctor.